The Royal Gems Golf City vision embodies as many as 63 golf holes as one connected property, making it the world is largest pure golf city and the final destination for discerning golfer from around the globe. This masterpiece project has secured a charismatic piece of land - 1,400 rai (approximately 560 acers) - the biggest in Thailand to accommodate 3 different styles of golf courses meticulously created by the world is 3 most talented golf courses designers. On each golf course, it is guaranteed that your every tee-off will redefine perfection. Address : 170/148 Moo 3 Salaya-Banglane Road, Salaya Putthamonthon Nakhon Pathom 73170 Thailand. 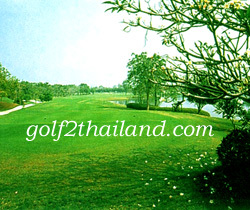 Located : North of Bangkok near Alpine Golf Club It takes about 45 minutes by car to reach the course from the city center of Bangkok.